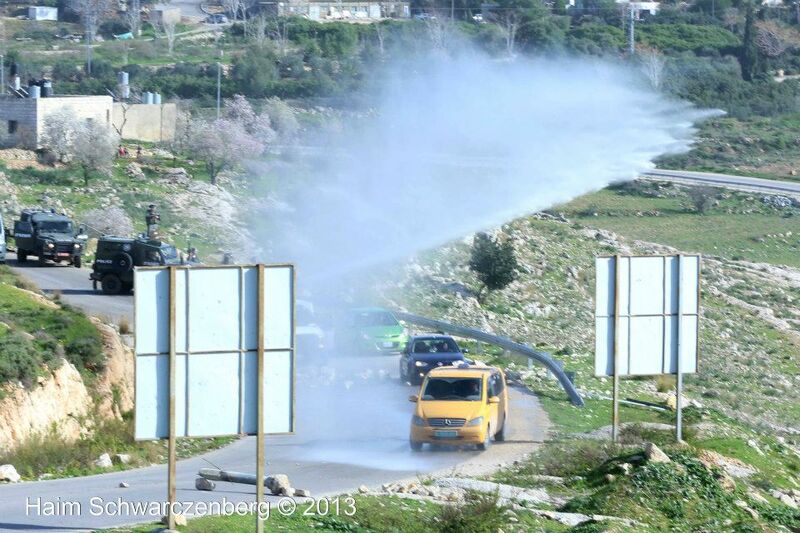 Israeli Occupation Forces have invaded Nabi Saleh on 4 March. 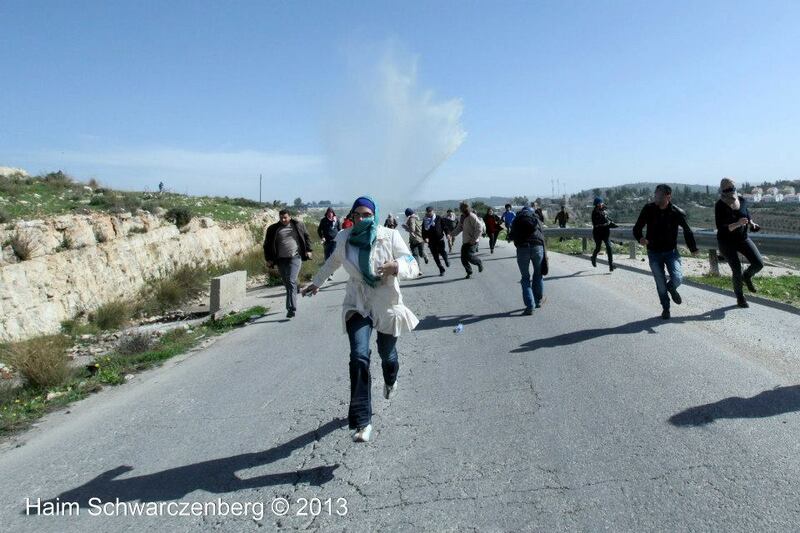 The IOF fired teargas and rubber coated steel bullets. Cars were also stopped and searched. At least two injuries have been reported. According to the Popular Struggle Coordination Committe, the IOF fired live ammunition, as well as teargas and rubber coated steel bullets. 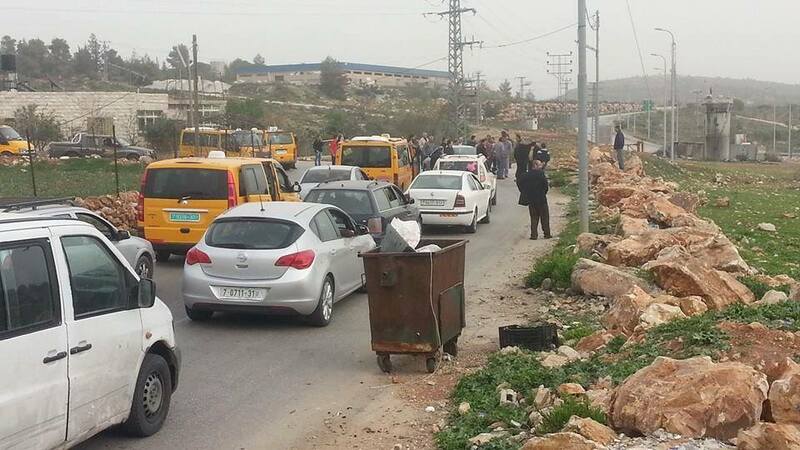 Israeli Occupation Forces invade Nabi Saleh, stop cars and search them. 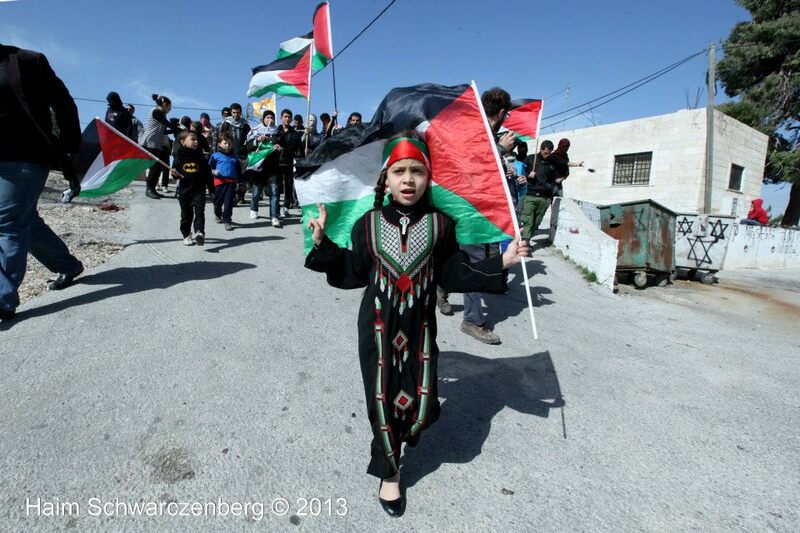 Photo by Tamimi Press. Israeli soldiers continued their assault against the Nabi Saleh village, near the central West Bank city of Ramallah, for the tenth consecutive day, firing rounds of live ammunition, gas bombs and rubber-coated metal bullets, leading to dozens of injuries and excessive property damage. Local sources have reported that dozens of soldiers invaded the village on Thursday evening, and that dozens of Palestinians have been treated for the effects of tear gas inhalation, while several children suffered anxiety attacks. The invasion caused property damage to at least three homes that were hit by gas bombs and rubber-coated metal bullets. Clashes took place between the invading soldiers and local youth who hurled stones and empty bottles at them. The soldiers, blocking the main entrance of the village, also prevented the residents from entering or leaving it. 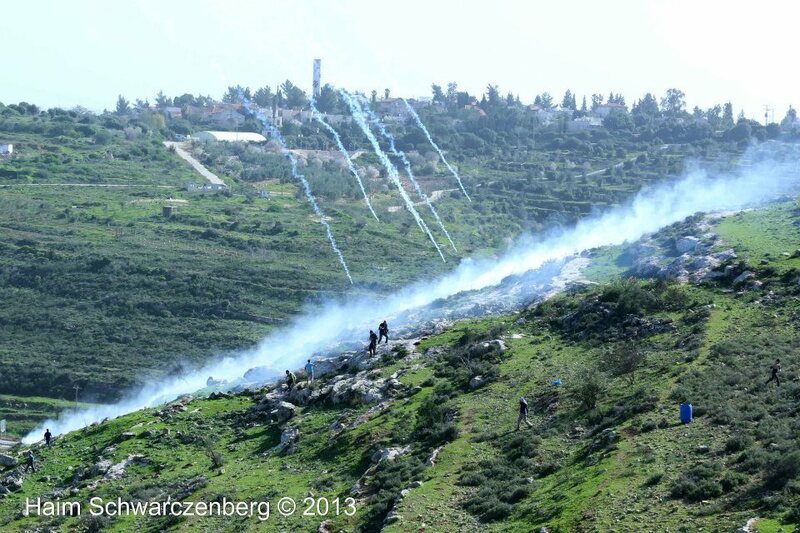 The Popular Resistance Committee in the village said that the invasion is part of an assault that was initiated by the army ten days ago, and part of Israel’s ongoing violations and attempts to end the ongoing popular resistance against the Annexation Wall and illegal settlements. The Committee added that the Israeli violations include nightly invasions and arrests of local activists and residents, and that the army is deliberately targeting local homes with live ammunition, in addition to its ongoing attacks against the Palestinian orchards, isolated behind the Wall. Israeli soldiers invaded, on Tuesday, at around 2 am, the village of Nabi Saleh, near the central West Bank city of Ramallah, violently searching homes and kidnapping five young Palestinian men. The Tamimi Press, in the village, quoted the soldiers claiming they are searching for what they called “wanted Palestinians”. It added that the soldiers carried photos of several Palestinians from the village. Soldiers then kidnapped Mohammad Atallah Tamimi, 25, Rami Hussein Tamimi, 36, Jihad Mohammad Tamimi, 23, Mahmoud Mohammad Tamimi, 19, and Basil Abdullah Tamimi, 16. 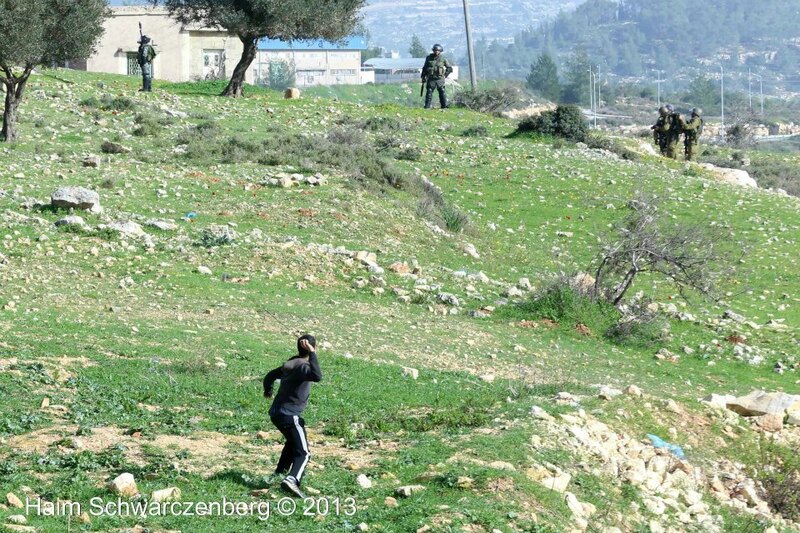 Tamimi Press has reported that the soldiers broke into its office and confiscated photos from its wall which documented the ongoing Israeli military violations against Palestinians, their lands and orchards. The soldiers also took pictures of several homes before breaking into them and ransacking their furniture and belongings. 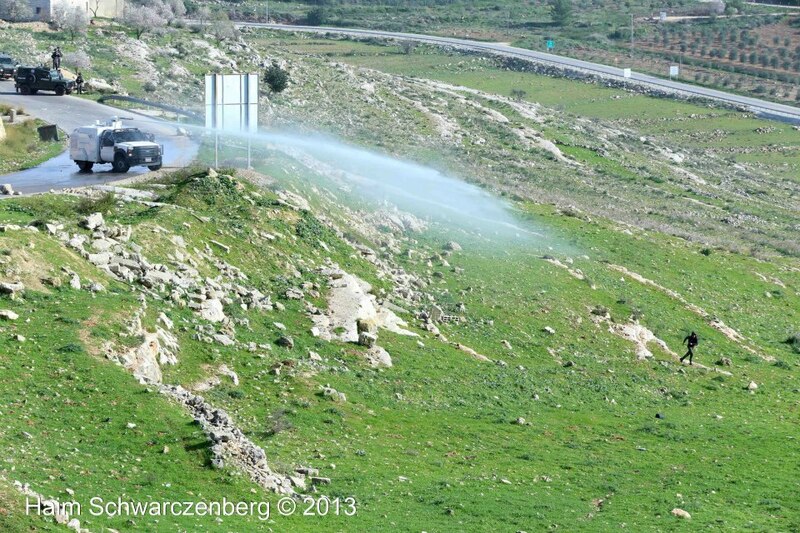 The army withdrew from the village later on, taking the kidnapped Palestinians to an unknown destination. RAMALLAH (Ma’an) — Israeli forces clashed with residents of West Bank village Nabi Saleh on Monday, witnesses said, after troops closed the main entrance to the community. A popular committee spokesman said Israeli forces closed the main iron gate leading to the village around midday, sparking clashes with local youth. Troops fired tear gas and rubber-coated bullets at the residents, he said. RAMALLAH (Ma’an) — Israeli forces detained 10 people across the West Bank overnight Sunday, locals and Israel’s army said. Four men were detained in the Ramallah village of Beit Rima, locals said, with clashes breaking out following the arrest of Ibrahim, Firas and Muhammad Rimawi. Another man was injured while being detained and taken to hospital for treatment, witnesses said. Israeli forces also raided several areas in Nablus, arresting five people, locals said. The headmaster of a secondary school in Balata camp, Farid al-Museimi, 47, was arrested by soldiers in his home. Soldiers also detained a Palestinian security officer Baha Jamil Mahamid, 22. 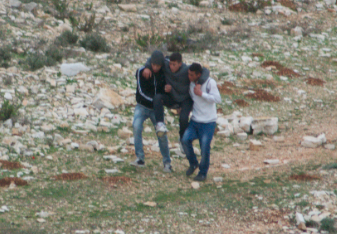 Saddam Raghib Salah, 20, Diyaa Abdul-Fattah Salah, 21, and Mahdi al-Shafi were also arrested in nearby areas of Nablus. 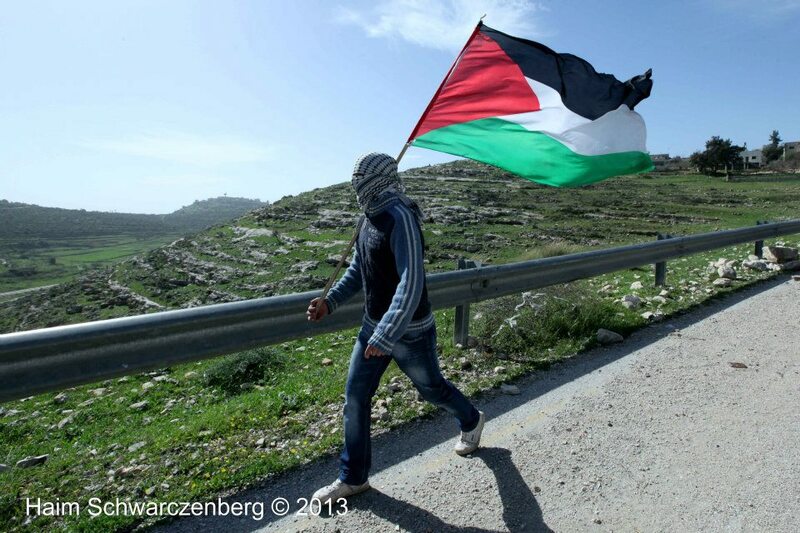 Abdul-Hakim Muhammad Awada Tamimi, 27, was arrested in the village of Nabi Saleh. An Israeli army spokeswoman said eight people were arrested overnight, including five in the Nablus area, one in Ramallah, one south of Bethlehem and one in Tubas.